It’s the great pumpkin! – Look behind you, a Three-Headed Monkey! 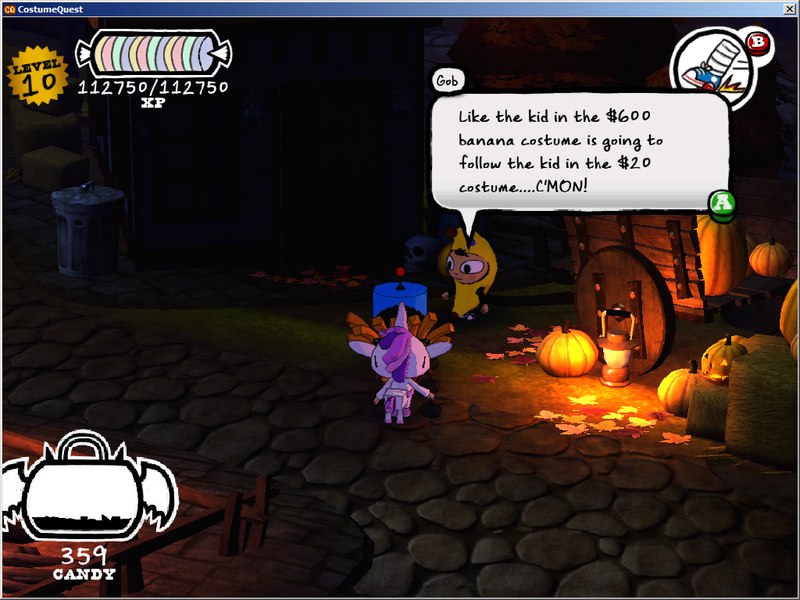 With Halloween practically knocking on our door, Double Fine Productions just released Costume Quest on Steam. While the game was released for consoles about a year ago, this marks Double Fine’s first game on the PC since the much-praised Psyochonauts in 2005. 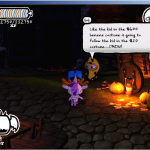 The game centers around a pair of siblings, named Wren and Reynold, and their epic quest to trick-or-treat their suburban neighborhood. Immediately, things go wrong when the first house they knock on is occupied by a candy-thieving, monstrous henchman who promptly abducts one of the two. The setting of the game can be described as a typically “Schaferesque” blend of Saturday morning cartoons and SciFi b-movies – that is to say, fans of his older titles will feel at home right away. As you search for clues leading to your siblings whereabouts, you explore the neighborhood and knock on peoples doors for more candy. Many of the houses have been taken over by other monsters though, which will attack you. In these situations, the game switches into combat mode where engage your enemies in a turn based fashion. Initially, you start with one costume, a robot, which changes your stats and gives you a special attack during combat. 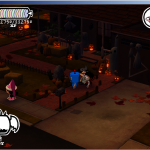 As the game progresses you can collect a dozen different costumes, all with unique properties, such as a Vampire and a Ninja. The costumes are usually acquired in a series of quests which provide you with a pattern, as well as the ingredients to build them. 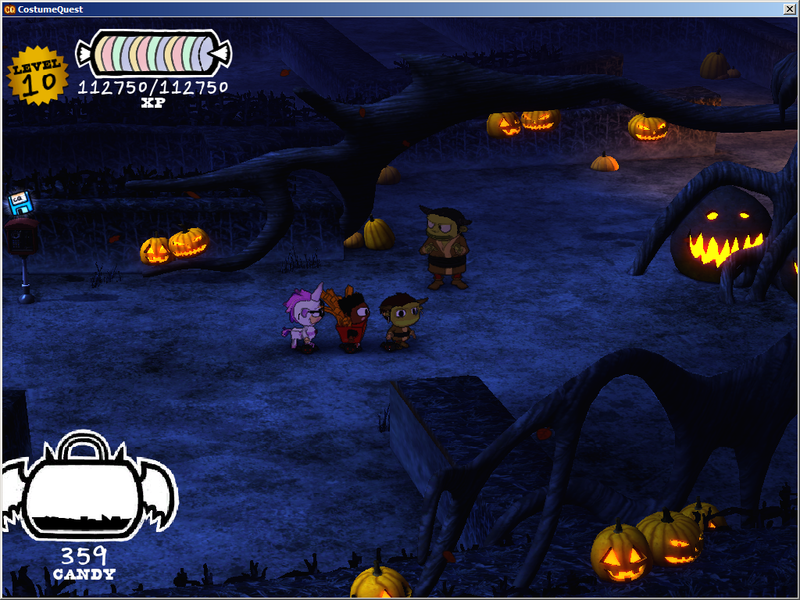 As you progress, you will also pick up two other kids who you can control during combat. 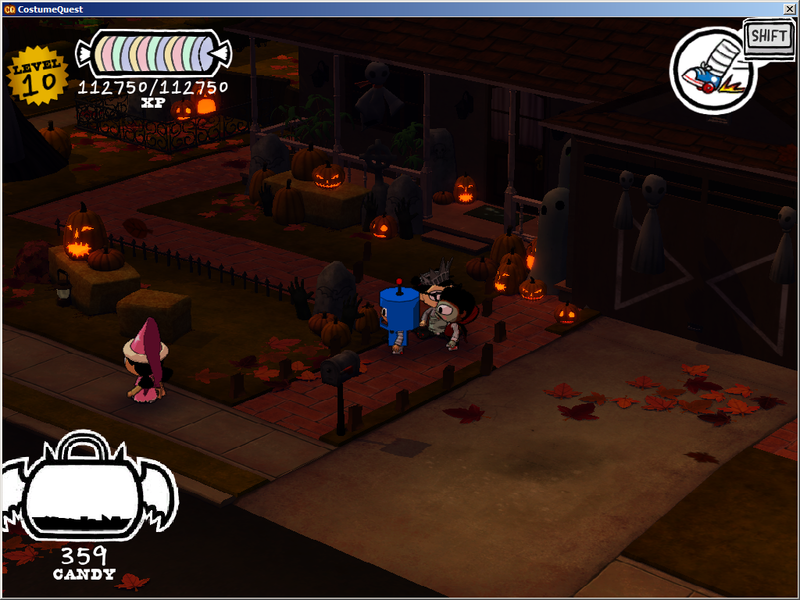 By having different combinations of costumes and special powers, this introduces some complexity to the combat. I found however, that aside from a few boss battles, once you master the mechanics, the fights do not require too much skill. Especially later on, when you gain special attacks that allow you to freeze your enemies for multiple turns at a time, so that you can beat them to a pulp. fun! Aside from this, there are quite a few subquests to be completed: for example, you have to try to find a number of kids hiding in the neighborhood, which as a reward give you a bigger candy bags and increase your base attack stats. Another mini-game lets your character bob for the largest number of apples in a certain time. The reward once again is candy, which you can use to pay for upgrades.